In an effort to bring you the most comprehensive and in depth hockey training I have created the complete guide to stickhandling. I have written a number of articles on stickhandling as well as produced quite a few videos but many of the How to Hockey readers wanted a complete guide that shows everything from start to finish. I spent the entire summer writing, editing and shooting video for this e-book and training video. Every time I thought it was finished I would remember a few more drills, or a few more tips but eventually I think I emptied my brain into this book and training video. Stickhandling Guide – You get an 18 page e-book that covers everything you need to know about stickhandling. This e-book will take you from knowing nothing to knowing basically everything. After you learn what is possible with stickhandling I show you how you can practice and train to become amazing with the puck. I include over 20 off-ice stickhandling drills to help you improve every aspect of puck control that I teach in the e-book. 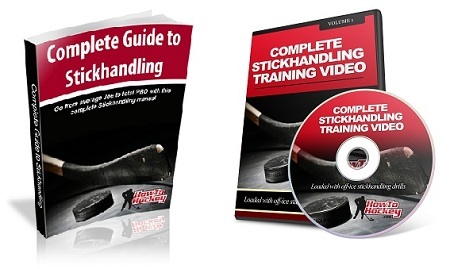 Stickhandling Training Video – The training video is over 30 minutes long and explains the concepts discussed in the e-book. I also show you exactly how to do every drill that was outlined in the e-book. Progress tracking sheets – I include a progress tracking sheet with instructions so you can keep track of your improvements. This will encourage you to keep on practicing and improving and gives you something to look back on and see how much you have improved. Hi Jeremy – I was just checking out your stickhandling guide and was wondering if it is applicable to the Mite/U10 level? I am looking to set up something in the garage for my kids this summer and was interested in this guide. If not, what do you recommend for the Mite/U10 level to help them develop over the summer? Thanks! I think they will learn a lot from the guide, it will help if you read through it as well so you can remind them of certain points that I teach. I include a number of stickhandling drills that they should be able to complete. my wife ordered the stickhandling guide for my birthday…the money was booked off the credit card via paypal, but we never received the guide! I just sent you an email with all the info you need. Thanks for ordering and if you need anything just ask. Hi Jeremy! May be you can post some examples from guide (for example, one drill with text and video) for acquaintance? Or the guide is like your learning video here, on howtohockey.com? Hi Jeremy. I just want to tell you that your stickhandling guide is perfect. I LOVE it! Keep up the good work because I love everything you do! All your tips are so helpful. How to hockey really helped me to improve my game. Thank!